Navigate with an easy to use and friendly web-based user interface. The user interface has an easy to use menu bar, consisting of multiple categories (Dashboard, Campaigns & Content, Media, Locations & Players, Departments & Users, Systems, Reports, Global Alerts, and Support). Navigate with an easy to use and friendly web-based user interface. The user interface has an easy to use menu bar, consisting of multiple categories (Dashboard, Campaigns & Content, Media, Locations & Players, Departments & Users, Systems, Reports, Global Alerts, and Support). Dashboard provides an overall list of features and resources you can quickly access through your interface. Campaigns & Content allows for you to create multiple campaigns and content which are designated to play anywhere from one to thousands of locations. The Media category consists of EZBoard, Microsite, App Store, and Cloud Storage, enabling for you to create, upload, or even store breathtaking templates, layouts, and content. Locations & Players allows for you to create and edit locations, add players, and view the overall health status of your players located throughout the globe. Departments & Users allows for you to set up permission settings and view account information. 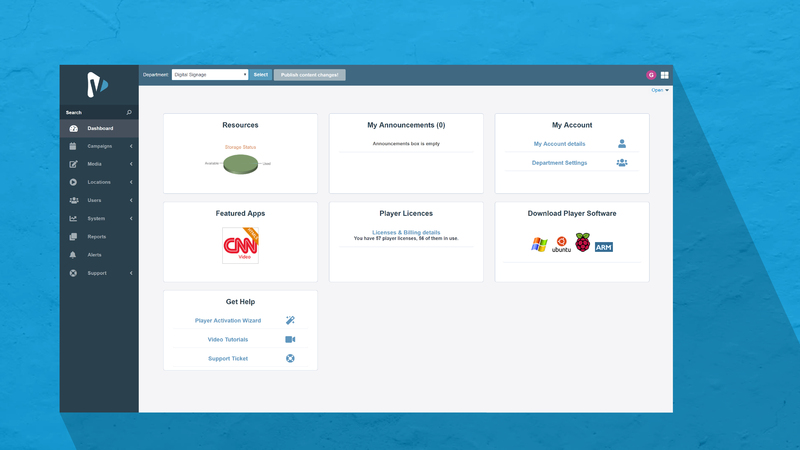 Systems allows for you to view your licenses and create content affiliates. Reports contain analytics which enables you to set up impression details. Global Alerts allows for you to create and release emergency messages and even generate a CAP alert. Support offers helpful video tutorials and a support ticket system for quick technical assistance.